All right guys, this is probably my last post with this challenge. Why? 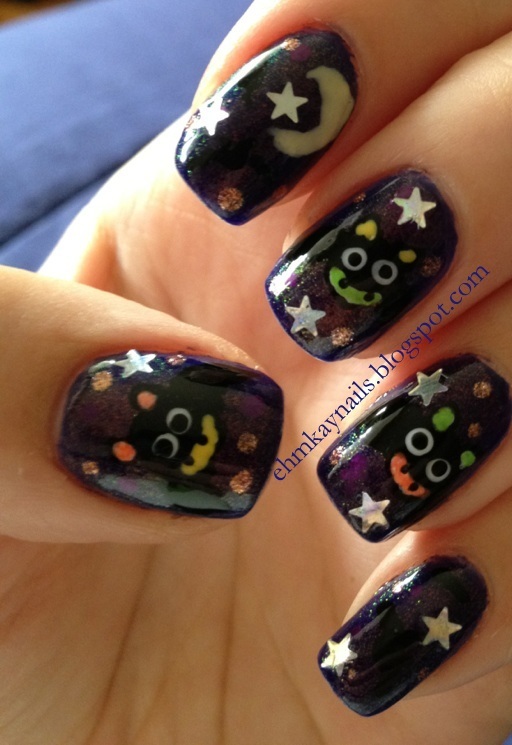 Because I am hoping to squeeze a few more Halloween designs for my Now and Then segment and the rest of the challenge simply doesn't fit. This could be a lie though, as I'm thinking of how to use China Glaze It's Alive (only just got it dustying) with graveyard? 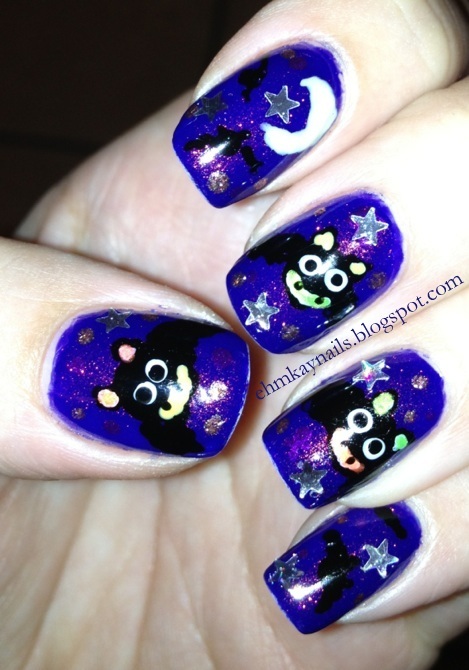 And I want to do a black cat design. And basically I have too many designs in my head....sigh. And I *still* have one more Breast Cancer polish to use. Uh, there's only 6 days left of October. 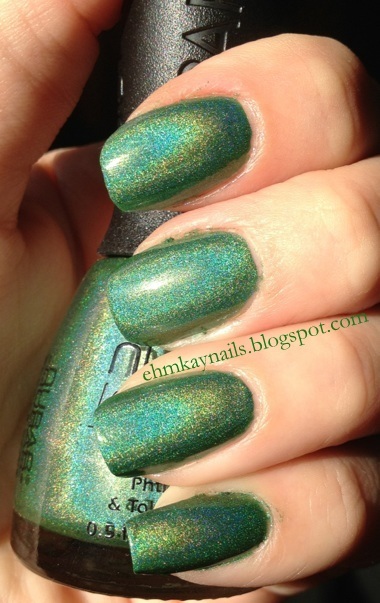 Anyway, a dear polish friend sent me Sheswai F**kyeah because I needed it for the color and the name. Since then, it has been renamed to something a little sweeter, but I like the original. Let me tell you this is THE MOST COLOR INACCURATE PHOTO EVER. Sorry :( My camera could not handle the creamy neon fuchsia. 1.5 coats as some needed two and others were good with one coat. 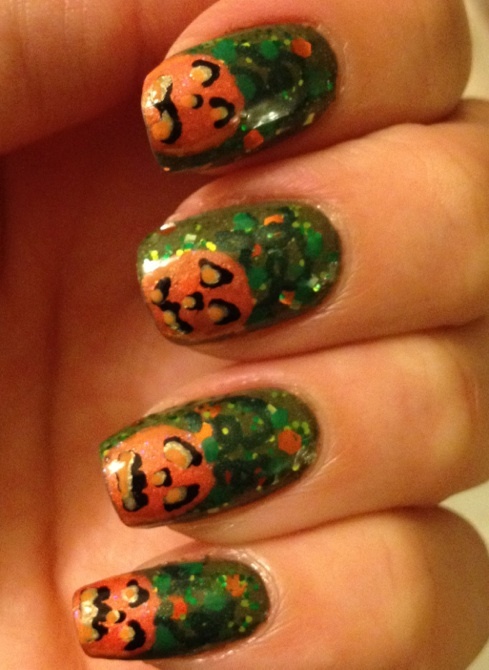 Then I used one coat of Hit Polish Witches Brew and I loveeeed it. Then someone in one of my polish groups posted a cute witch hat mani so I took inspiration from her and painted on witch hats with some basic colors. Although my nails are a bit busy, I still kind of love them! Enjoy! To interrupt our Halloween programming, here is something bright, cheery, and represents one of the many illnesses October represents. Most known is Breast Cancer Awareness (but please don't forget, all diseases and illnesses should be discussed all year long; there is no need to focus on one illness per month). Breast Cancer Awareness is especially important to me as it has a long history in my family, so do make sure to get your yearly check ups. I have quite a few designs for Breast Cancer Awareness, and here is my first one. 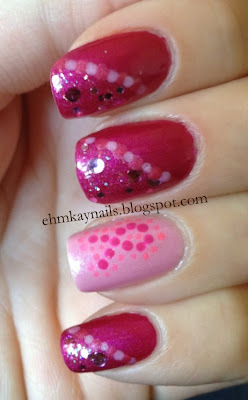 A reader asked if I would come up with designs incorporating pink, besides just using pink cremes. 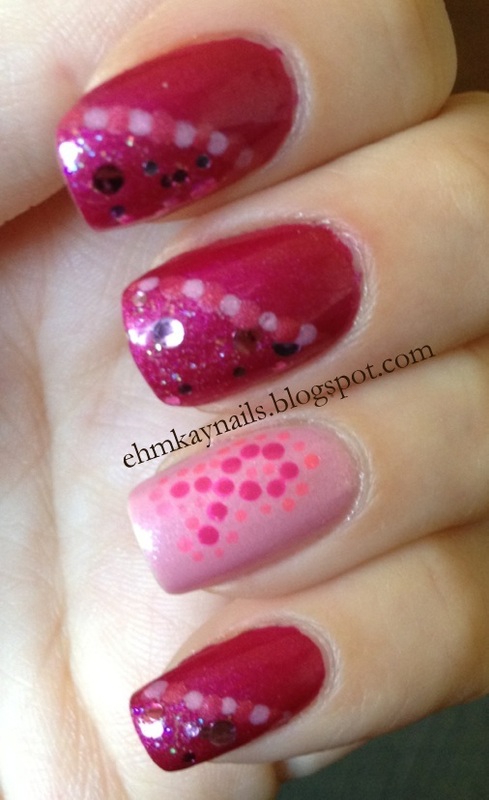 Well here is so somewhat easy nail art and if you don't have dotting tools, simply use the end of a booby pin! 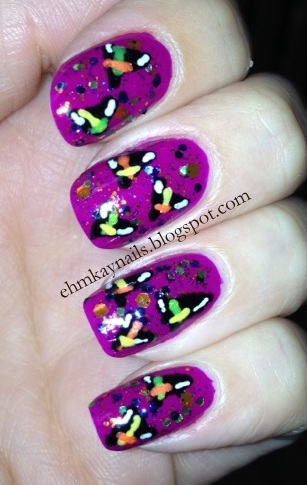 I started with two coats ManGlaze Lesbihonest and the accent is 3 coats OPI Pedal Suzi Faster! Have to admit, I hated Lesbihonest matte. 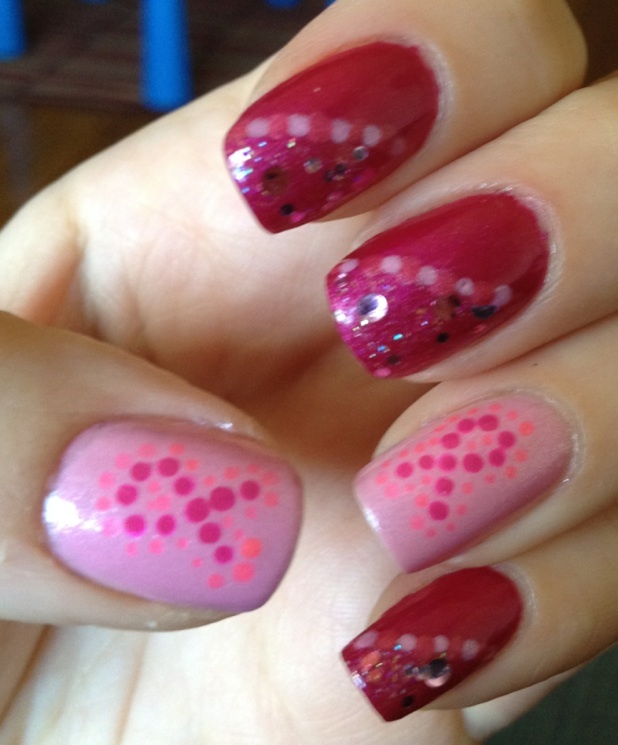 It looks uneven and lumpy but that was settled once I used top coat. 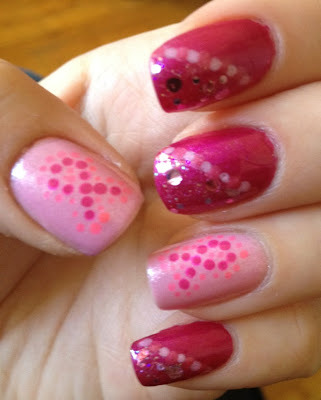 I then used Elevation Polish Daisen as the glitter and used ManGlaze F**k Off and Dye and OPI PSF as dots. I love this technique. 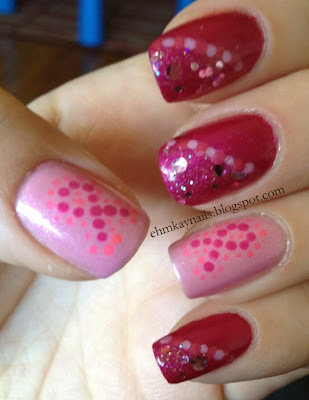 No tape needed because the dots cover up the imperfect line. Lastly, I used Zoya Lara and China Glaze Pink Plumeria for my ribbons. Lots of pink, but I love this. 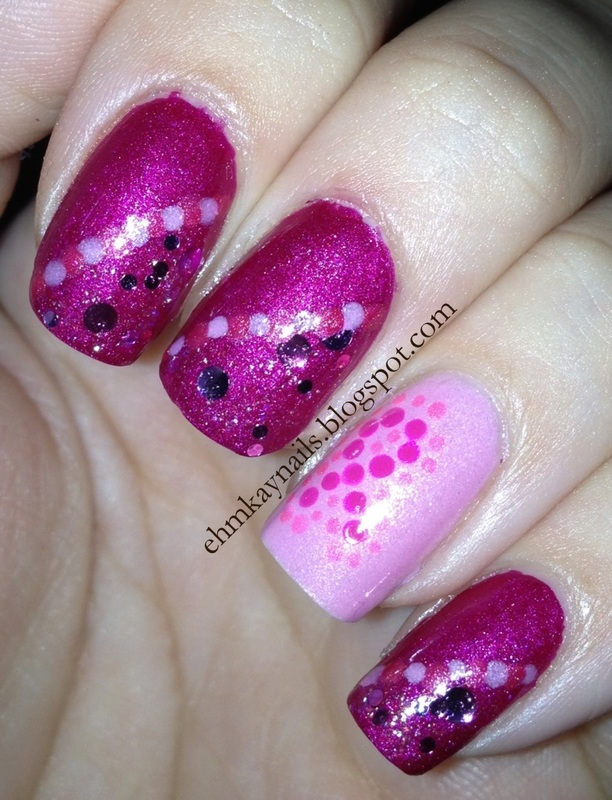 Daisen is so unique as it is made up of pink and copper CIRCLE glitter in an iridescent base. LOVE LOVE LOVE. I still have some other pink polishes and designs to show you and I hope they inspire you so you can represent awareness with some awesome nails! 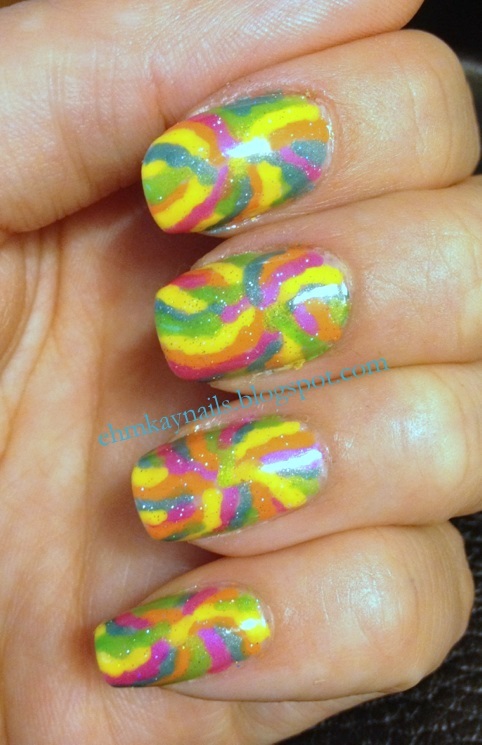 I posted this mani on instagram, so make sure to follow me! Username is MichaK23. I'm attempting to use instagram more :) Also, find me on Facebook! 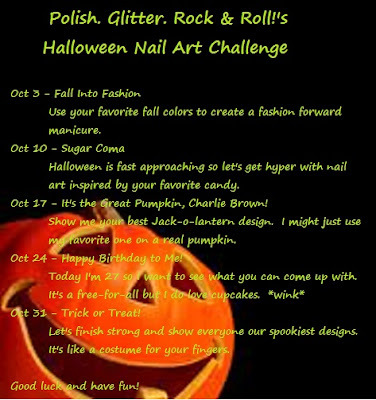 For the second to last Halloween challenge for Danielle's challenge, we are celebrating her birthday! She loves cupcakes, so I gave them to her! First I started with two coats of Suzi Skis the Pyrenees Suede, which I found at my CVS (woot!). Two coats for opaqueness, but I forgot to take a picture of this suede and alone. Go me. 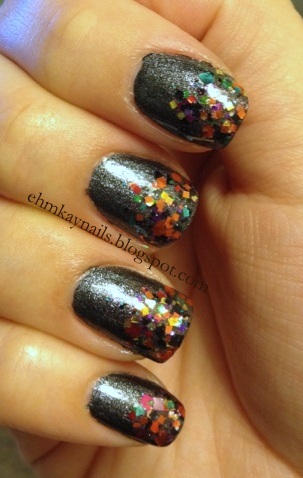 But it's a gorgeous grey and comes alive with top coat aka, if you find it, buy it. Or any suede. 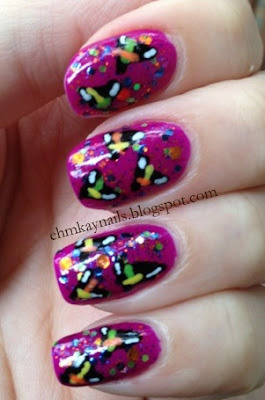 For all my nails except for the two cupcakes, the then dabbed on Lynnderella One Nutty Fruitcake and made it as a gradient. 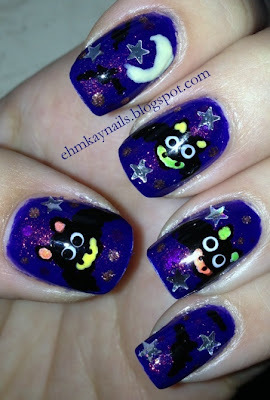 Then I decided it was fun for sprinkles, but not Halloween enough. So I then dabbed Cauldron Drippings over it for a more Halloween feel and woah. 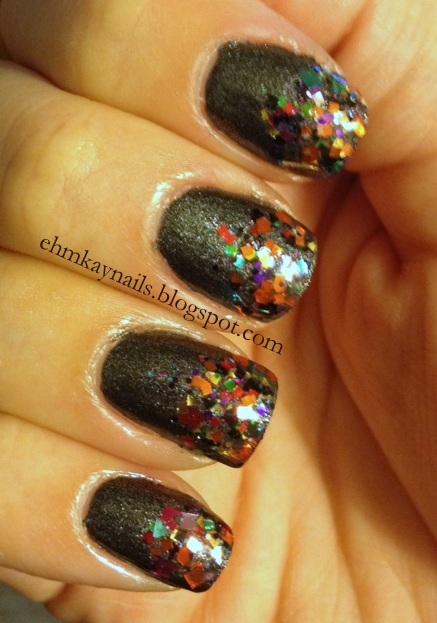 Lots of glitter but perfectly smooth with two coats of top coat. So blingy. Then I made my cupcakes. 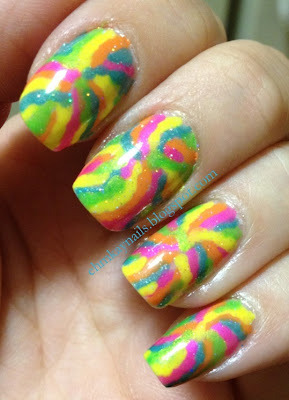 I used Wet N Wild Nerd Alert: Screech for the cupcake wrappers. 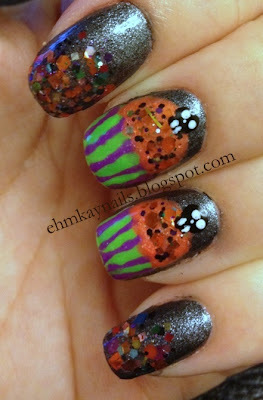 Then I used two blacklight pumpkin polishes (magenta and orange). I dabbed on Wet N Wild Tangled in my Web and Lynnderella Cauldron Drippings as my cupcake sprinkles. Then lastly, I used a dotting tool to create my skull cherry on top. Basically, I love this and I will be happy if it lasts even one day because it is PRETTY thick. Haha. Unfortunately, this was my first time using Elmer's glue as a base. It made removal a breeze, but that's because they slid off like 2 hours after I woke up. So sad. 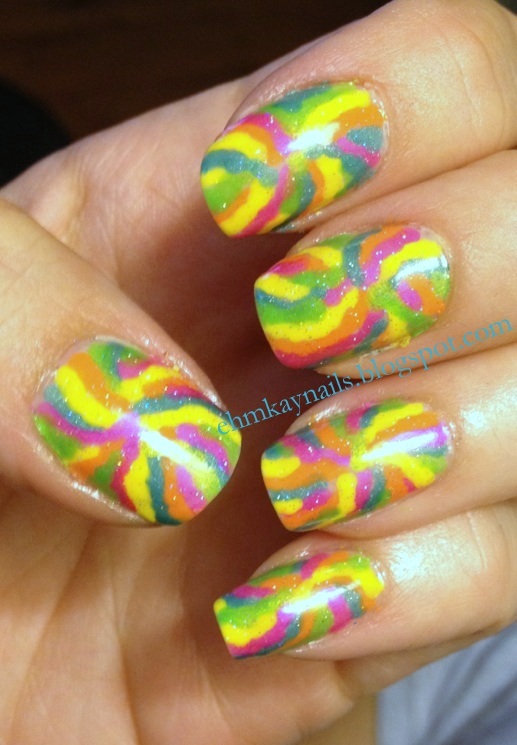 I loved this mani so much. Glad I took a few shots of it in my car driving to work (in the parking lot, I was safe). I have been updating my Facebook more regularly, with previews and links to my instagram, so check it out and "like my page." For the gradient category for the This is Halloween challenge, I went for simple but gorgeous. I lemmed Butter London Shag so hard and finally picked it up during Ulta's BOGO sale. This color is a stunning shimmery/metallic brown. Two easy coats and I called it a day. Then I realized I finally had an awesome base for Sonoma Nail Art Clockwork, which was RAOKed (random act of kindness) to me along with a few other Sonomas. I really have "met" some amazing polish friends who really have the biggest hearts. 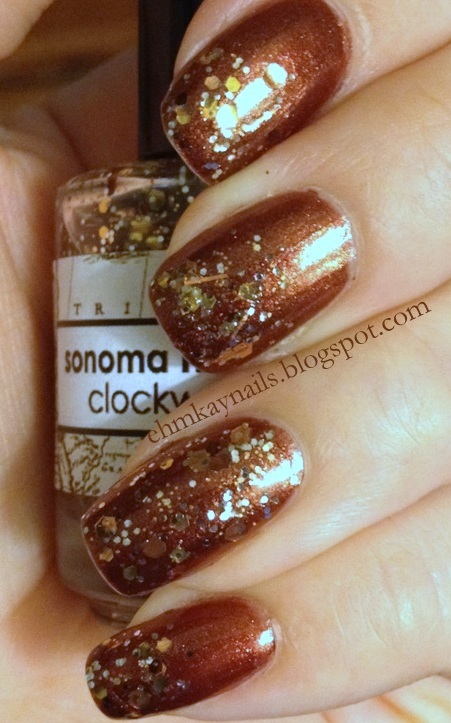 I love brown and brown glitter...woah. This one is exactly what I wanted Lynnderella Change to be. 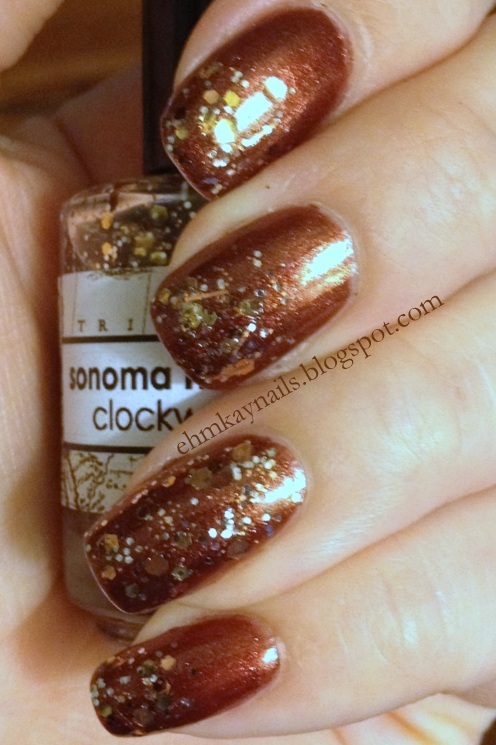 While I still LOVE Change, I really like the versatility of Clockwork because it has a clear base. 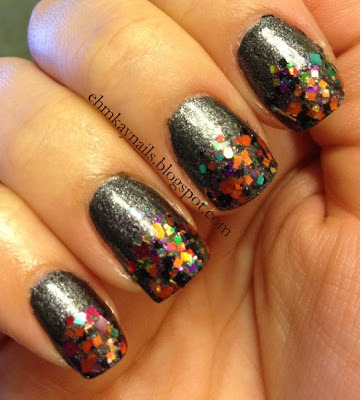 The glitters are the standout here. 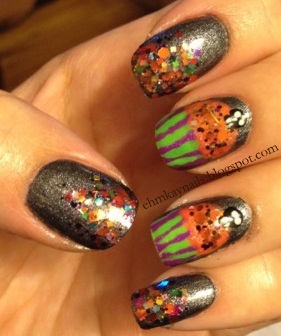 There are a few bar glitters, but they are really sparse. Love this combo so much. AHHH! Three more days to vote for my Monster Mash Nail art! #26 in the freehand section! I would appreciate all your votes. Click here to vote! 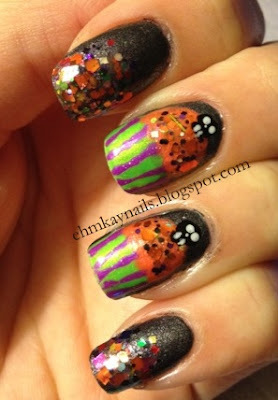 So much Halloween goodness. I think the only non-Halloween manicure I have done this month was my most/least expensive polish but I do have a reader request for something specific, so I'll have that for you in a few days. 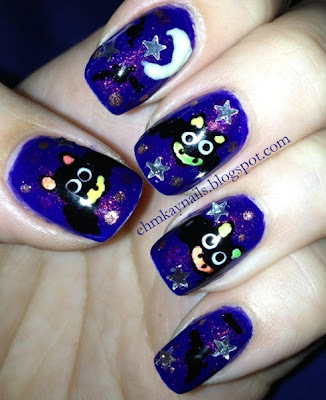 I seem to be taking the cutesy route for my Halloween nail art. 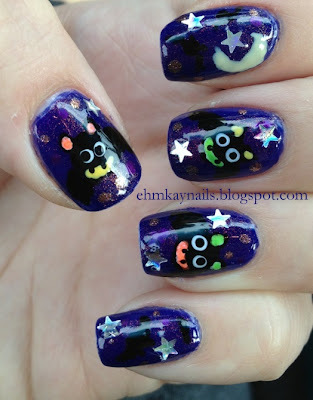 I found gel clings a few years ago with the most adorable bats. 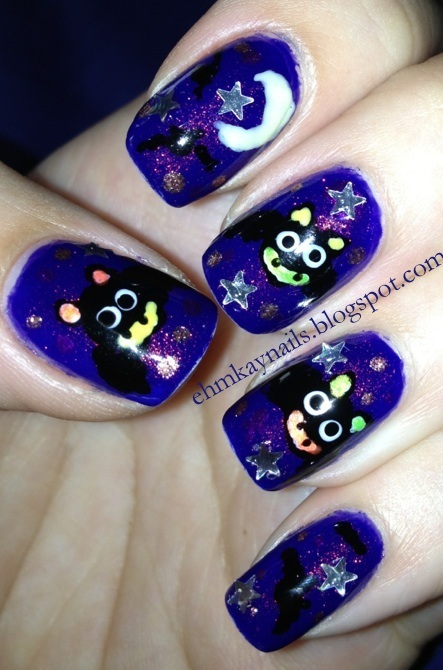 I almost copped out of this challenge (by doing half my nails bats and then adding another art to it) when I saw them on my window! Of course though, I broke a nail and nubbinized, so my canvas isn't as large as normal. 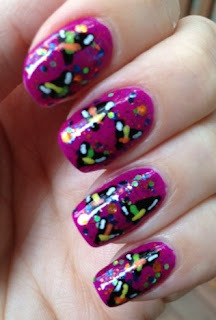 I used Barry M Indigo (2 coats) and Max Factor Fantasy Fire (1 coat) as the base. Two untrieds that my lovely friend Kim from England sent me in April. I cannot believe I waited to use these! Fantasy Fire flashes red, gold, and green, and emulates that dusk scenery for my bats. I then went in and painted some smaller bats with larger detailed one. 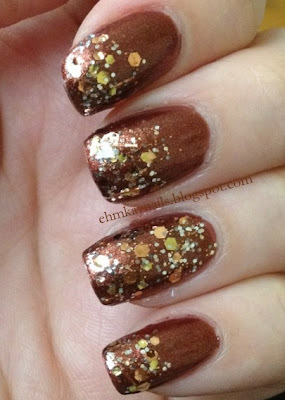 Lastly, I used my Wet n Wild The Star of the Show (holiday 2012 collection that I stumbled upon) as accents. 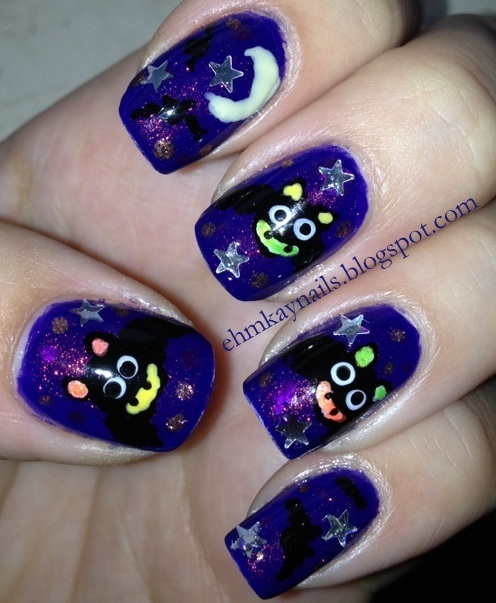 Quick nail art, but cute nonetheless. I took most pictures with flash; it's not very color accurate but otherwise the bats were blending because of the lack of sun. Oh hello, winter. 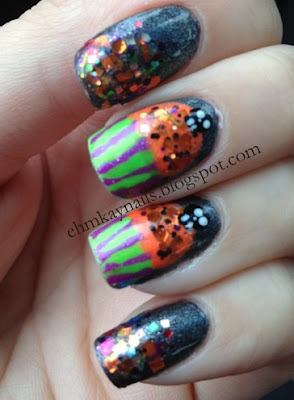 Only 4 more days for you to vote for my Monster Mash mani! Remember you can vote daily HERE. #26 in the freehand category! So when Danielle said It's a Great Pumpkin Charlie Brown, I got a little literal. 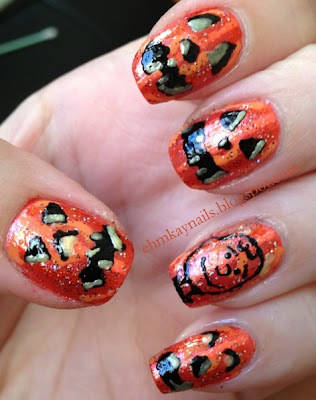 You saw my Jack-O-Lantern nails for the other challenge here, and I wanted to change it up. 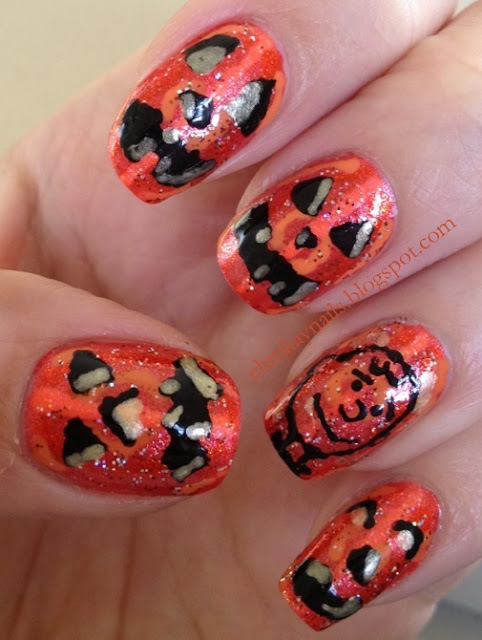 Last year I did a black mani for my Jack-O-Lanterns. 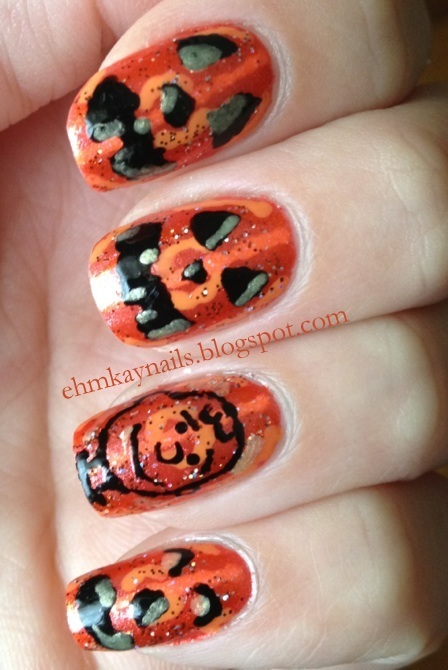 It's a popular design, but then I thought...have I ever seen a black pumpkin? Uh, no. So instead I carved Charlie Brown and his pumpkins. 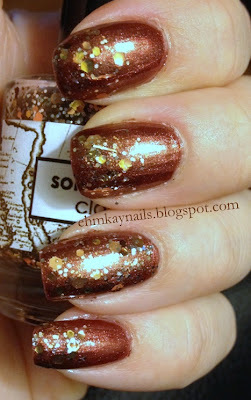 So for this mani, I decided to use Zoya Myrta, which I put into my blog sale because I ordered it on mistake (meant to get Kimber). 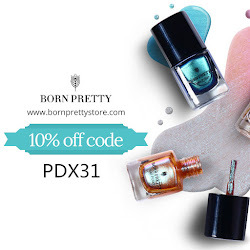 I decided to use it and um, no longer in my blog sale :-D (but there's other stuff, so check here if you're looking for some inexpensive polish). 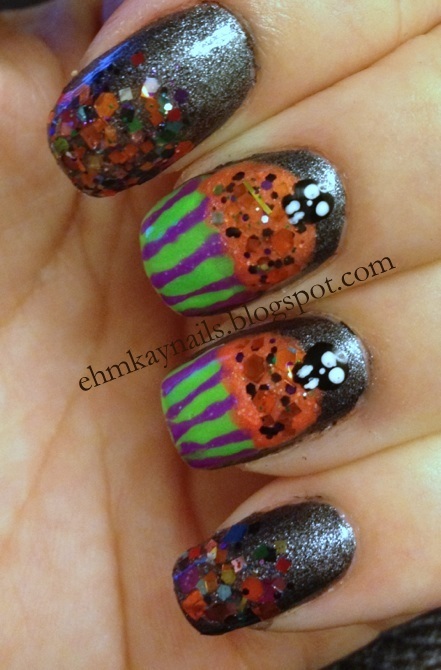 Then I added detail with an orange pumpkin polish, China Glaze Riveting, Zoya Arizona, and China Glaze Glitter Goblin (one extremely thin coat...that glitter is DENSE). I could have stopped at Zoya Myrta, but I like a little depth. Number of untrieds: 2. 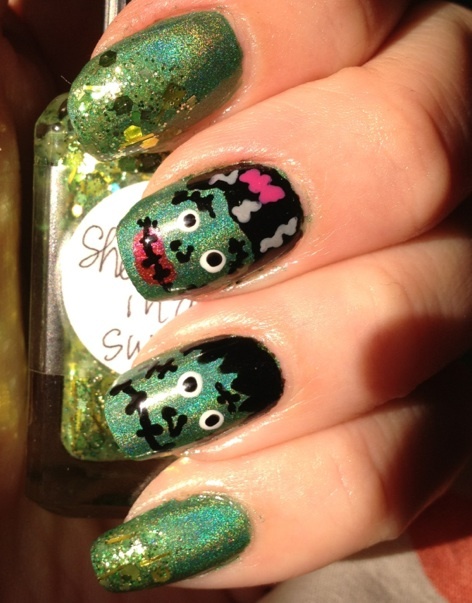 Three if you count Sheswai So Cute on my toes (which is an amazing creme by the way). 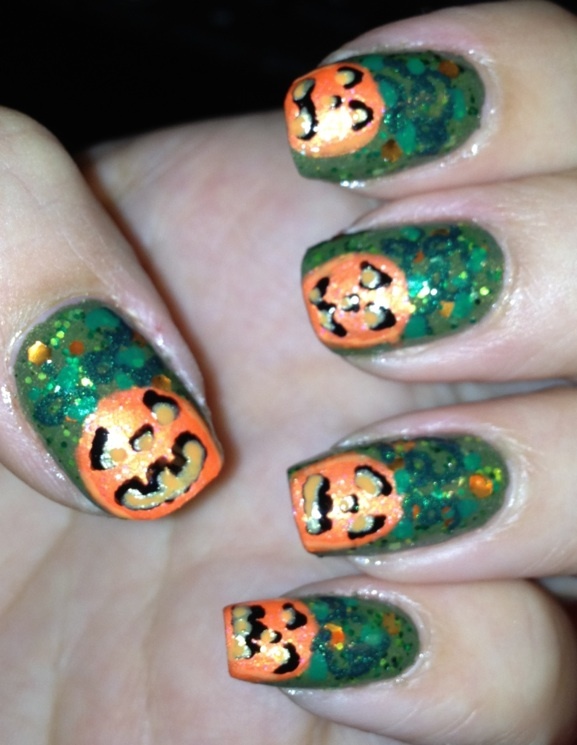 Hope you enjoyed my mani! I used a glue base coat so let's see how removal is tomorrow. 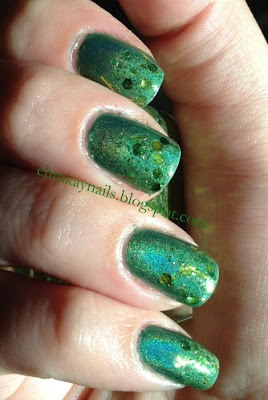 Those Zoyas from the Surf collection are a pain to get off! Please take a moment to like me on Facebook! Just a few more days to vote for my Monster Mash mani! #26 in the freehand category HERE. Hmm...so I went for a little bit of a stretch here. I don't really care for bloody, flesh colored nails. 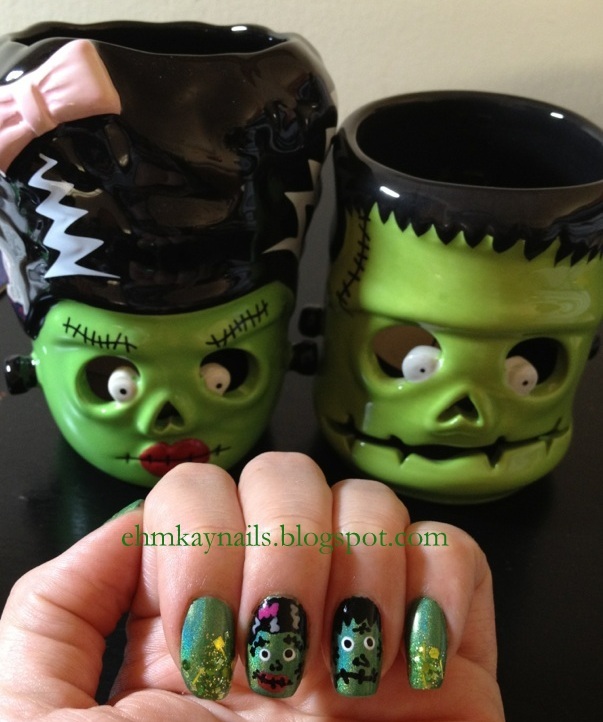 Plus, I really wanted to get a Frankenstein mani in and well, Frankenstein is technically not alive. And he walks. So he is sort of a zombie? Right? Just say yes. Two coats of Nubar Reclaim. Holy mother gorgeous green holo. This type of green is my absolute favorite. How was this untried since April? WHOOPS. Thank goodness it was sunny yesterday. My mom bought me these adorable candle holders about a month ago. Last year, I got the giant Frankenstein candle holder (also a mini one, and a giant pumpkin one, and I really love Halloween) and this year I needed these. Hence, my nails. On my non Frankie fingers, I dabbed on Lynnderella She Lived in a Swamp...which I've had since February. Gorgeous lime green glitters. I've posted a macro. We've got microglitters, some bars (not my fav), small and large squares, hexes, everything. Love how many untrieds I'm using. So take a gander at my hubby and wifey Franky-style. 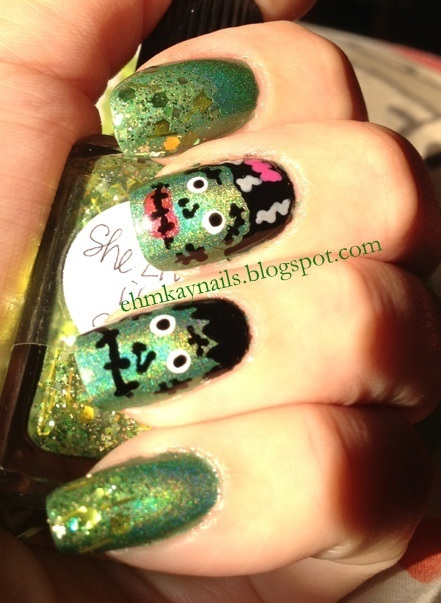 So here it is, my then picture: Man, my Frankensteins looked like they were having some awkward moments. 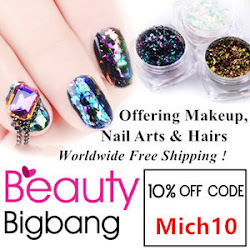 I didn't have a green as rich as Nubar Reclaim and remember using Milani Hi-Tech and one of those black striper nail polishes. I actually still love these. 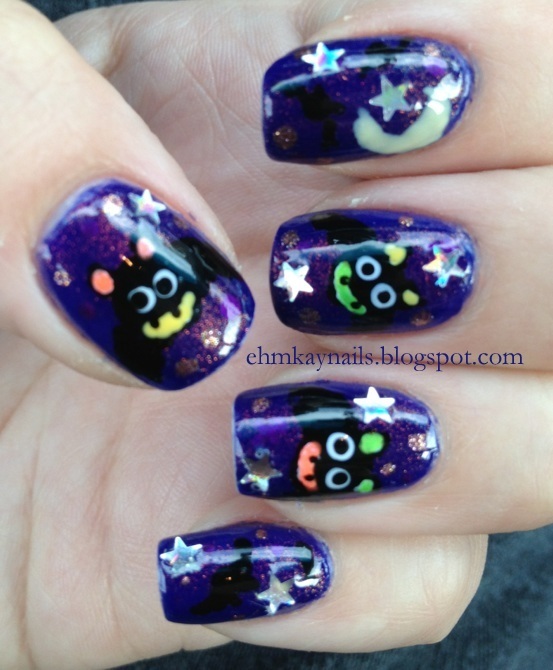 I may do these exact ones again if I have time. 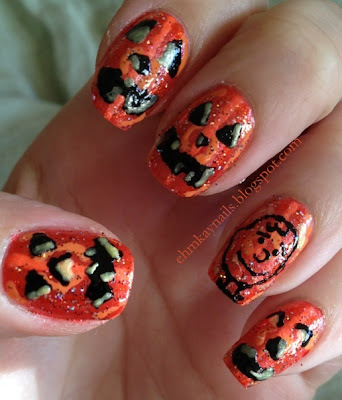 Sonoma Nail Art Sincerest Pumpkin Patch with Jack-O-Lantern Nail Art! There's a few more days to vote for my Monster Mash manicure HERE! 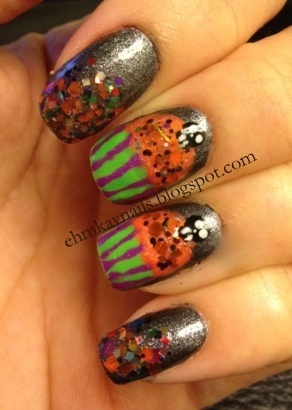 I am #26 in the freehand category and would so appreciate it! 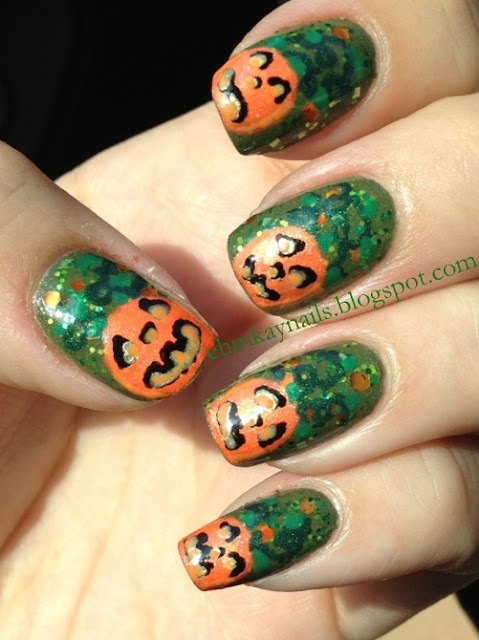 Another nail art challenge...A friend of mine grabbed two of Sonoma Nail Art's Sincerest Pumpkin Patch and was so kind to pass one on to me! It was the only one I thought I needed, but since then I have decided to get two others from the collection. They should be here any day! I am a habitual layerer. I get to use more untrieds and conserve my glitters! Plus, it is easier removal! 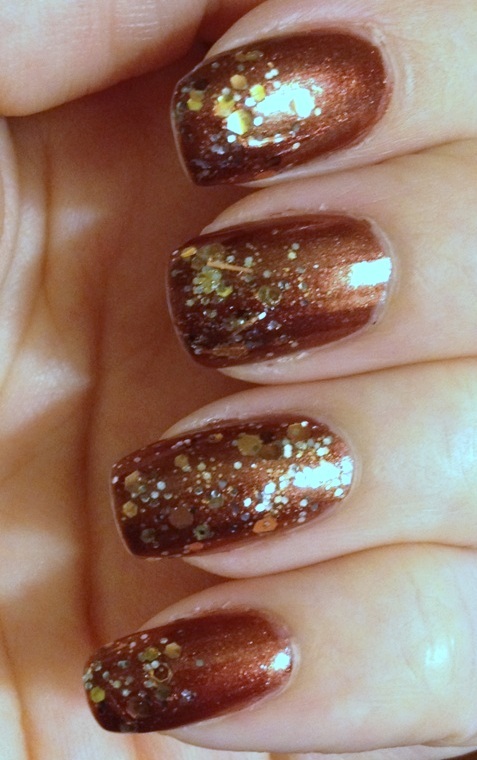 I did two coats of Zoya Yara, which has been an untried since December 2011 (hangs head in shame). 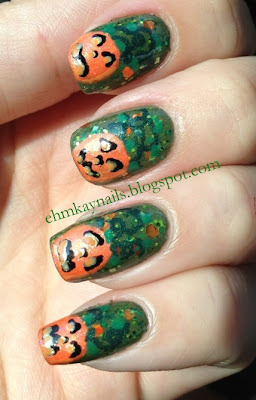 Then I topped it with one coat of Sonoma Nail Art Sincerest Pumpkin Patch, which actually looks like a pumpkin patch! I will say that weirdly the smaller orange hexes did not want to come out as easily, but then bigger orange ones came out perfectly. 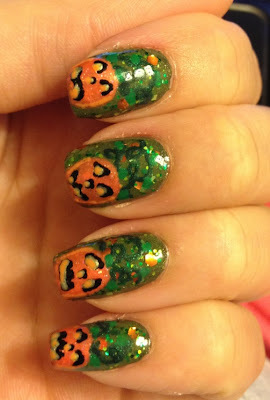 Then I went to town with my Jack-O-Lantern pumpkin patch! I chose Yara because I wanted a darker green to represent the sunset so the pumpkins could "glow" in the night. The pumpkins are actually a black light polish, but unfortunately I do not own a black light! 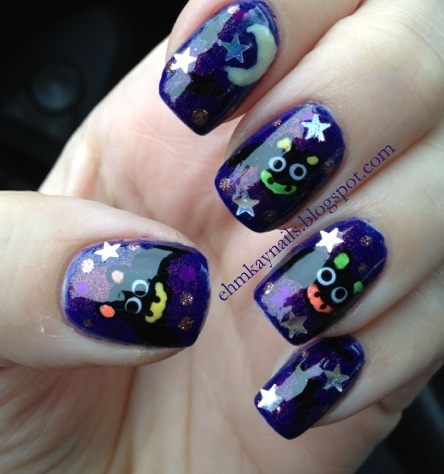 I have to say I will definitely be rocking a variation of this manicure throughout the Fall. I loved it so much! On to the pictures! With flash so you can see how bright it was! 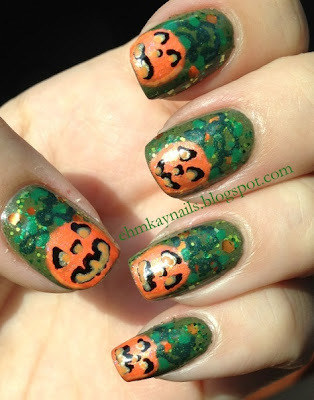 For this art, I used Pumpkin Polish Orange, Zoya Arizona, Wet N Wild Black Creme, Wet N Wild French White, Borghese Limoncello (gelato version), Revlon Emerald City, and Sally Hansen Going Green. Check out my jewelry shop on Etsy HERE! 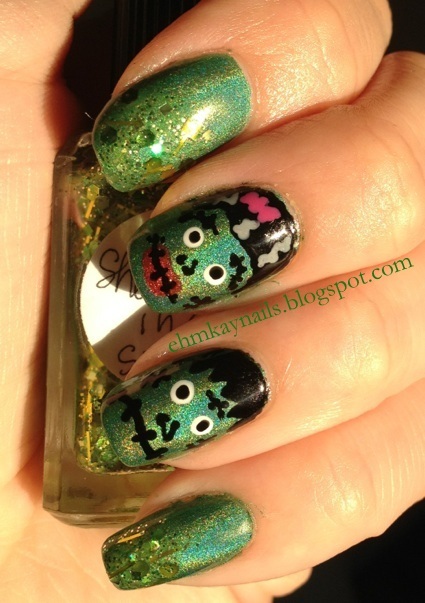 Just ten more days to vote for my Monster Mash manicure HERE. #26 in the freehand category! We are moving right along with our Halloween challenges! 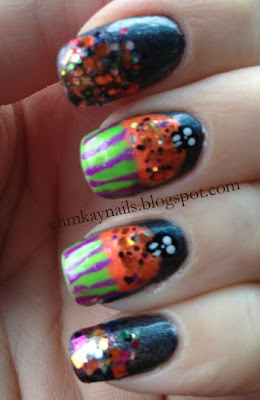 Today continues Danielle's Halloween Challenge, which is at the end of the post so you can see what to look forward to! 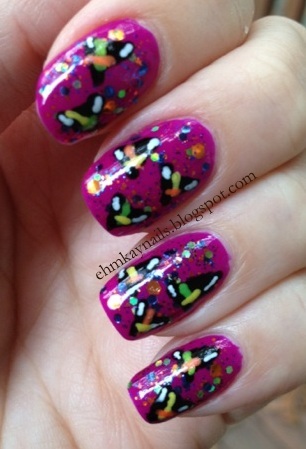 To achieve this look I started with a base of two coats OPI Don't Touch My Tutu. Why? I don't know. 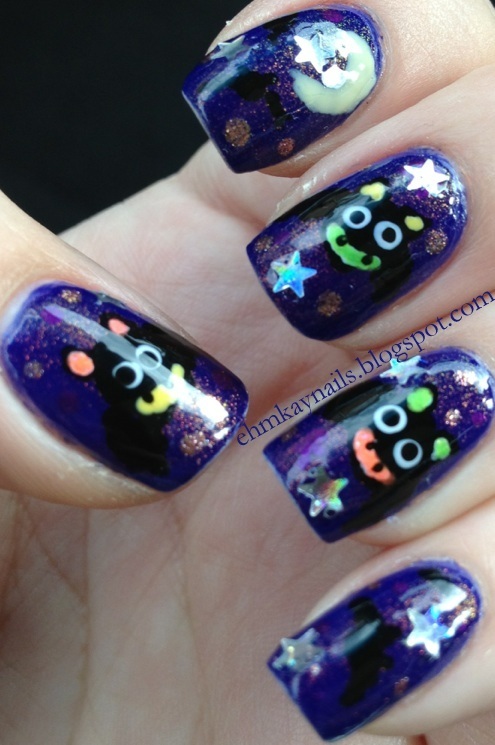 I thought there might be some visible nail with this look. But I ended up covering the nail. 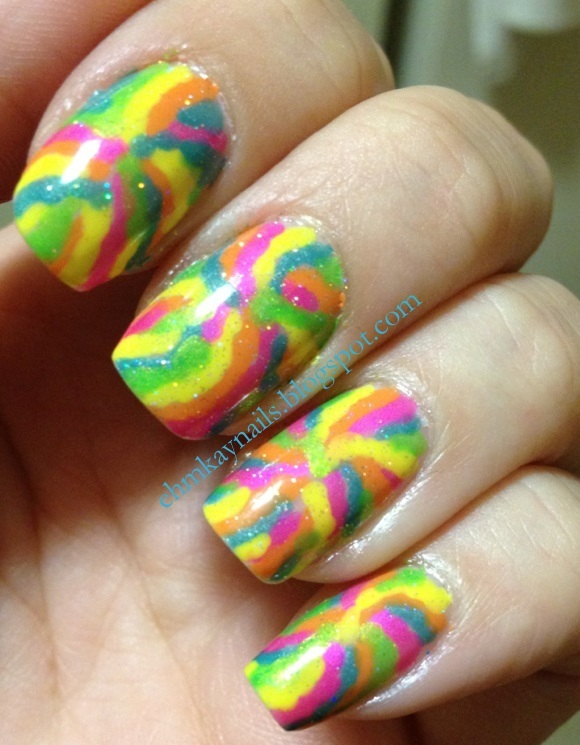 DTMT may have allowed my colors to be more opaque though as I did not need two coats of any color. 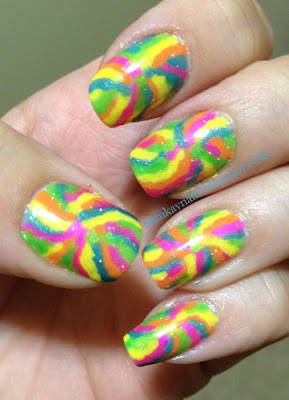 I decided I wanted my rainbow lollipop to be more neon. 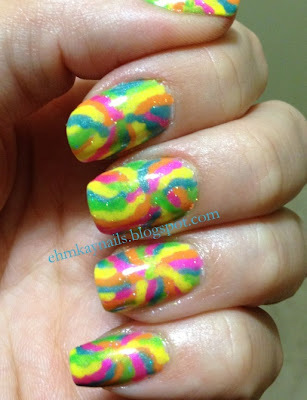 I used China Glaze Hang Ten Toes, Zoya Arizona, Ulta Sunsational (go to yellow for nail art), Wet N Wild Nerd Alert: Screech, and Manglaze ILF. I topped it all off with a coat of Northern Lights. 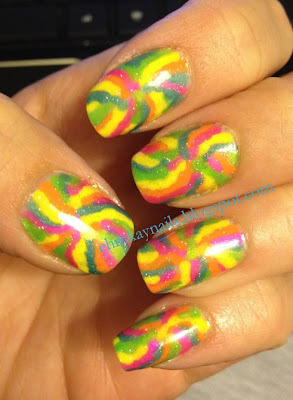 I was going to do this an as accent nail then loved it so much I did both my hands. O_0. It's definitely attention grabbing. I have been updating my Facebook with previews, so make sure you check out and like my page! 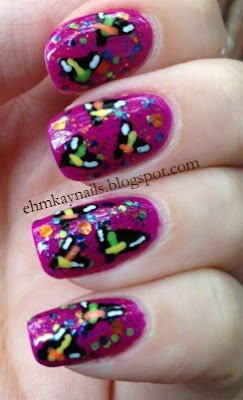 It's Time for Autumn: Falling Leaves Nails!